Stanley Lambchop is just a normal healthy boy, but ever since a large notice board fell on him, he’s been only half an inch thick. But amazing things can happen to you when you are flat! 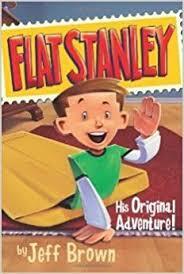 Enjoy the magical and brilliantly funny adventures of Flat Stanley by Jeff Brown. You will make your own Flat Stanley and Airmail envelope. This activity is suitable for children aged 5-8. Tuesday 20 February, 10:30-11:30 at Elland Library. Tuesday 20 February, 2pm-3pm at Rastrick Library. Tickets are £3 per child and are available through Ticketsource. For further information email Elland library at elland.library@calderdale.gov.uk or call on 01422 374472. For the Rastrick session email Rastrick library rastrick.library@calderdale.gov.uk or call 01484 714858. This entry was posted in Elland, Feb, Rastrick, Young People and tagged Elland Library, Friends of Rastrick Library, Rastrick Library.